Hua Guofeng, the successor of Chinese communist leader Mao Zedong, died this afternoon in Beijing at age 87 from an undisclosed disease. Born Su Zhu in China’s Shanxi province in 1921, Guofeng became a Communist Party member at age 15. 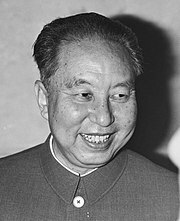 Soon after, he became known to Mao Zedong in 1954, and as a result rose quickly through the party ranks. After he succeeded Zhou Enlai as China’s Premier, Guofeng was chosen by the dying Mao to be his successor. After becoming Premier and Chinese Communist Party Chairman, he ended the Cultural Revolution and had the Gang of Four (including Mao’s last wife, Jiang Qing) arrested. A vain leader, Hua had the National People’s Congress, the CPC Party Congress, and all schools hang portraits of Mao side-by-side with himself in prominent positions. Hua also attempted to change the Chinese national anthem’s lyrics to incorporate Mao Zedong, however these revisions were rejected. He was effectively ousted in 1978 as a result of Deng Xiaoping‘s increasingly strong grip on the Communist Party. Guofeng was replaced as Premier in 1980 ending four years of service.